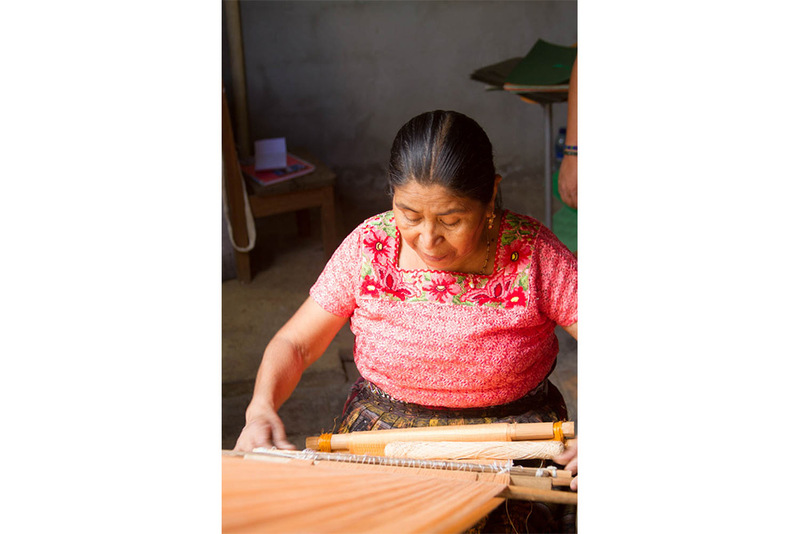 WEAVING A FORTUNE: Teresa Ujpan Perez, 60, plays an integral part in a cooperative focusing on hand-crafting traditional Mayan clothing on a backstrap loom (Luke Dawson). In a small, tin-roofed building along the coast of San Juan La Laguna, a town located between two volcanoes, a group of Tz’utujil women have dedicated their lives to saving a dying art—organically planting, spinning and weaving cotton, all of which is done by hand. From the outside, the branches of a tree with roots deeply ingrained inside the building, are clearly visible. Inside, colorful skirts, scarves, beanies and belts are seen from the entryway as tourists stroll in. Sitting on wooden benches placed beside freshly-dyed cotton yarn, the tourists face Ana Maria Navichoc, 32, who’s in the middle with three specific cotton colors: khaki, white and brown—basics she will use to demonstrate the ancestral art of spinning cotton. 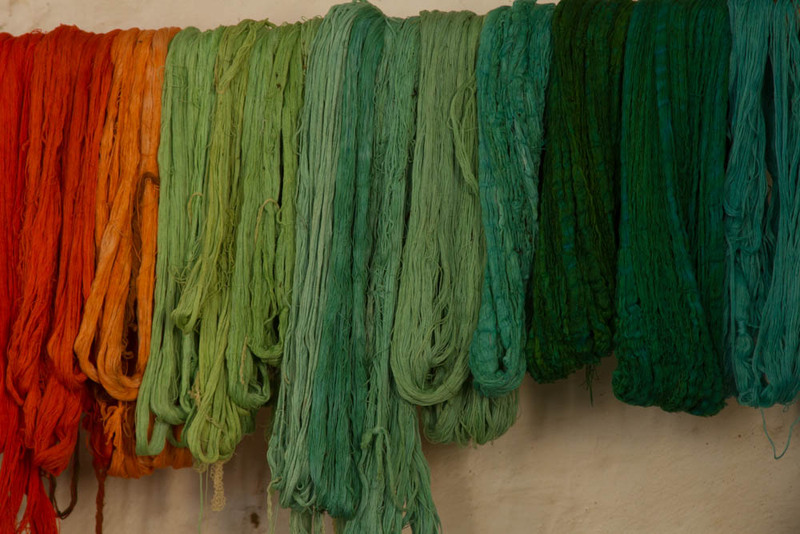 To the right, an abundance of string dipped and dyed in familiar colors hang on the wall. With the tools needed to manifest her love for hand weaving placed in front of her, Navichoc grabs a piece of cotton and starts massaging her fingers through it. “Us women here are a group of 22 who work with organic cotton. The process involves collecting cotton from trees,” she says as she begins illustrating the work it takes to preserve the all-natural, 100 percent organic art mastered by Casa Flor Ixcaco Weaving Cooperative. 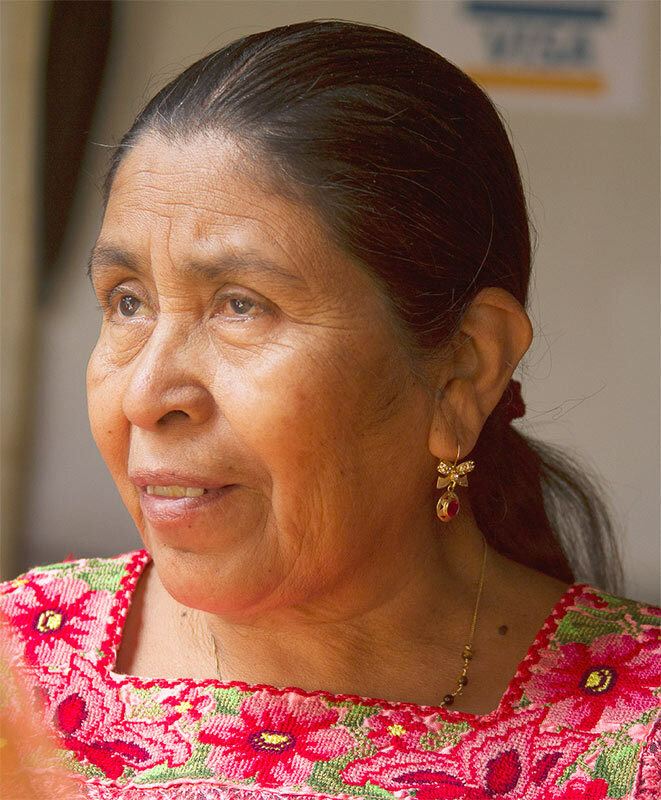 The cooperative is a nonprofit organization formed by Teresa Ujpan Perez, 60, which focuses on hand-weaving traditional Mayan women clothing—a tedious process that can take anywhere from eight to 18 hours. At 8 years old, Ujpan Perez’s grandmother taught her how to weave clothing. After years of practice with the backstrap loom, an instrument made up of six sticks designed to make complex textiles, Ujpan Perez has taken initiative and without knowing, weaved her own fortune. A fortune not measured by the amount of money, but instead by living in harmony with nature to keep the tradition at its purest, most natural form. In 1996, Ujpan Perez gathered five of her friends with the intention of selling handmade crafts. Those five friends eventually invited their own friends to join the group and before she knew it, 22 women had turned into a cooperative. But it wasn’t until 2009 that the women decided to work exclusively with organic cotton. Weaving organic cotton consists of several parts: the picking of cotton, cutting bark or natural products, spinning cotton, dyeing the cotton and lastly, weaving. Each woman generally has their own cotton tree or plant, including the one on-site, that they pick cotton from. Once picked, the removal of seeds and leaves follows, but the seeds are kept to plant more cotton. Then, Navichoc beats the cotton for 20 minutes with sticks shaped as a wishbone. This helps smooth out the cotton before preparing to spin. A thin, wooden spindel is now held inside a bowl as Navichoc gently threads out one delicate, white piece of thread. A thread so thin that it could easily fit its way through a needle hole. Using the tip of her fingers, she wraps the yarn around the spindel and spins it continuously, mimicking the circular motion used when making American cotton candy. She does this until the yarn emerges into a ball. This practice alone takes up to 15 hours. Before continuing, Navichoc passes around previously dyed yarn glued onto a piece of cardboard with names of plants and natural products used to dye the yarn, like an oak bark and eucalyptus. At first glance, oak bark looks like nothing more than a home for insects, but with a little rainfall, the emergence of colors through plants became apparent. The discovery occurred when Ujpan Perez’s husband was working in the mountains collecting firewood for their home. Her husband gathered dry firewood and stacked it outside. Moments later, it started to rain. The colors reflected off the soil resembled the colorfulness of the people and since then, Ujpan Perez and the women of the cooperative have experimented with everything from charcoal, basil, curry and even onions. 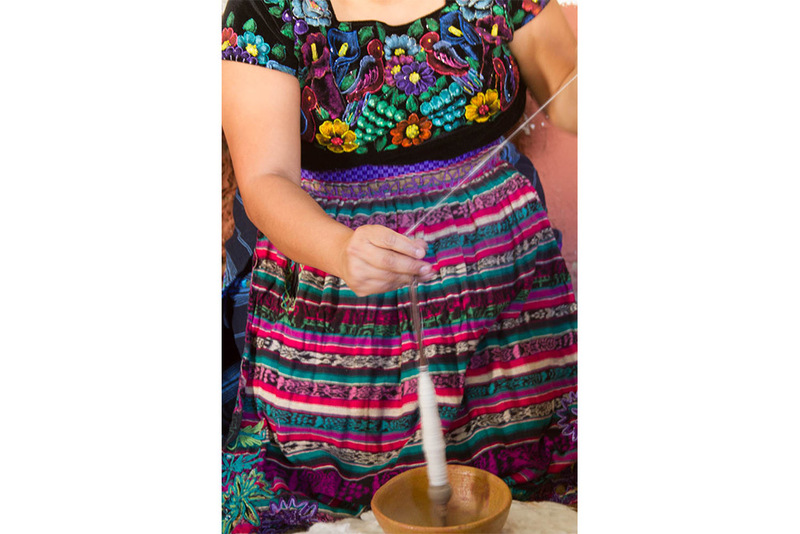 Because the cooperative usually weaves trajes tipicos, or traditional dress, the women generally only work with certain colors when serving villagers. 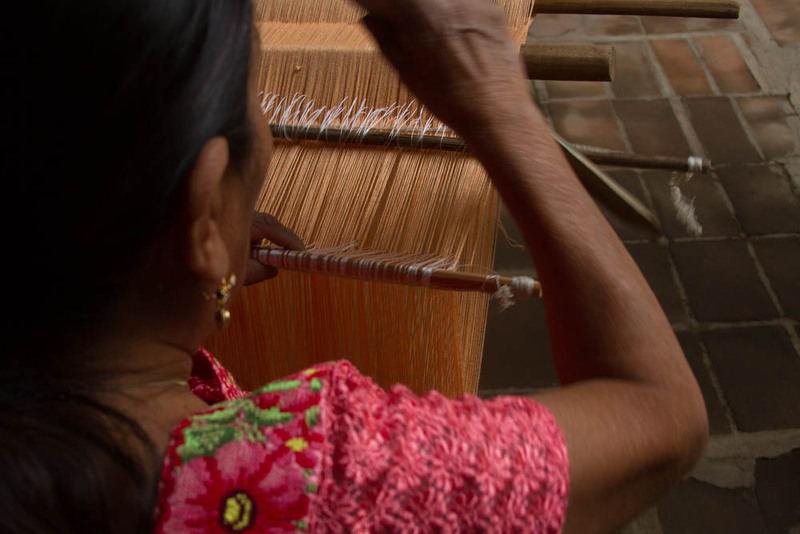 “Colors to each tribe have already been established—for example, San Juan’s traje tipico is typically red—so each weaver usually knows what clothing color and style to use based on (the color of the tribe),” she says. However, the cooperative does work with 34 exclusive colors that each woman has the ability to pick from their own personal gardens. The color dyeing takes almost as long as the spinning. Navichoc now grabs a tin bucket that has been soaking plants in water for 12 hours in order to efficiently extract as much color from it possible. She then stretches the yarn, forming it into a circular band before carefully dipping into the water. “The yarn has to be wet so that it absorbs the tint,” she says as she drenches it in the water. Slowly, she walks over to the stove where cinnamon leaves saturated in banana sap has been boiling in large pot. Navichoc dips the yarn in and out of the boiling pot, moving it counter clockwise each time until the white yarn in its entirety comes out as a blue celeste. A few feet over, Ujpan Perez prepares the backstrap loomer for the final step—weaving. Backstrap weaving is tedious as a waistband must be strapped around the waist and connected to the loom, all while leaning back for hours, but Teresa remains cheerful. When asked why she chooses to do everything by hand instead of a machine, she looks over, smiles and says, porque me gusta, because I like it. 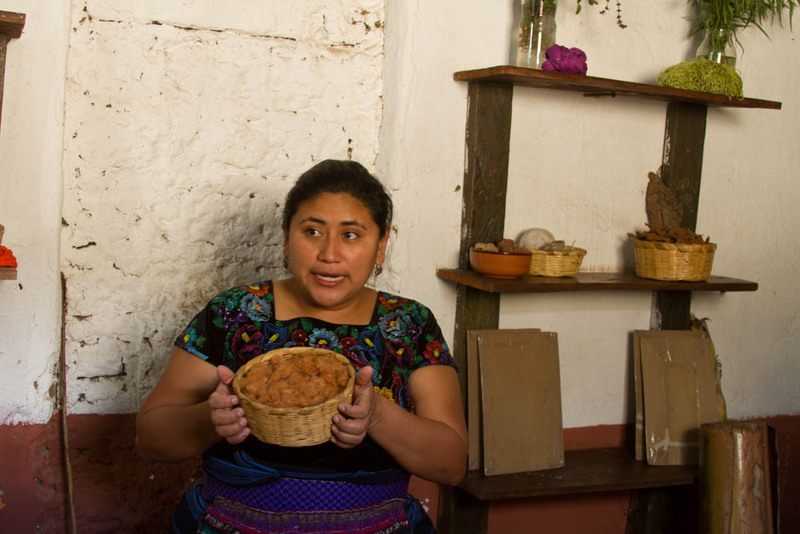 For the women of the cooperative, keeping their culture alive is a priority. It’s what gives them meaning to their life. The skill of spinning cotton is crucial for Navichoc to pass on, as her grandma was one out of the five ancestors remaining in town that knew how to weave by hand. Navichoc then turns to speak to the tourists, understanding that she looks just as foreign to them as they look to her. All her work is done out of love and respect she has for her heritage. It’s a way for her to share her culture with the outside world. Helen and Claudio Martinez, a couple from Portland, Oregon, roam around for items to purchase. It’s their third time in Guatemala and the process of hand weaving still leaves them in amazement. 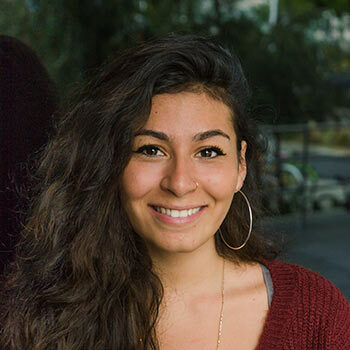 Elaiza Armas is a student at Cal State Fullerton pursuing a bachelor's degree in journalism. Her primary focus is writing about women's rights and the underrepresentation of Latinos in the news media. During the summer of 2015 she will be traveling to Panama as a freelance writer to discover her voice while reporting on the injustices of the indigenous community. After graduating, she hopes to move to Central America as an international reporter to further her career in journalism. © 2015 CSUF International Reporting. All rights reserved.